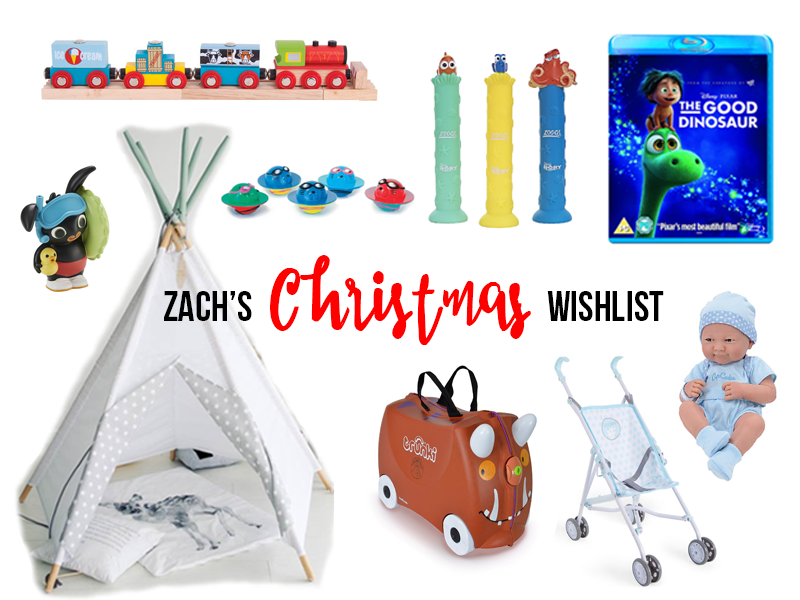 A couple of weeks ago I shared my Christmas wishlist, so I thought that I would do the same with Zach's. 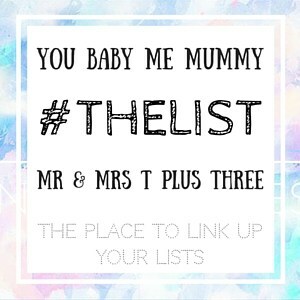 Obviously, these aren't things that he's asked for himself, as he can't talk and doesn't even know what Christmas is, but they're a mix of things we've bought for him ourselves or mentioned to our family and friends who would like to get him something. Bigjigs Wooden Goods Train - this is actually just one of a few wooden train set items we've bought for Zach, as he is absolutely obsessed with them at the moment. We have a total mix of brands in our wooden train set collection, but I've been really impressed with the quality and variety in the Bigjigs range so I'd definitely recommend checking them out! Bing Bath Squirters - I think that this set of three bath toys would be a great present for Zach as he absolutely loves bath time, and could do with a few knew toys to add to his collection. He is a huge Bing fan, so these would be perfect for him! Tipi - this is Zach's big present this year, and I can't wait for him to see it. I've had my eye on it for so long now, and it is so perfect for him as he has so many things in the same grey and white star print. I hope to make it super cosy with blankets and cushions so that he can have his own little den to hide in. Gruffalo Trunki - We do a fair amount of travelling with Zach, and we don't yet have a suitcase of any kind for his things. I've heard so many great things about Trunkis and would love to get one for Zach, especially this one as it has been made to look like the Gruffalo! Pushchair and Doll (similar) - I actually bought these for Zach in the sale months ago and put them away for Christmas. He loves pushing other people's dolls around, so I thought we would get him his own little one. I'm not even going to go into how ridiculous I think it is that they tend come in either pink or blue, but at least they market them now for both boys and girls. The Good Dinosaur - We've bought this Blu Ray for Zach to put in his stocking, and I really hope that he will enjoy the film. He loves dinosaurs at the moment, and we already have a little toy Arlo, so I think it will be a big hit, and perfect to watch on cold winter afternoons. Zogg's Dive Sticks & Seal Flips - Zach absolutely loves swimming, and at the moment we have one lesson a week. I'd like to try and take him on another day in the week too, so we can have some time playing in the water and practicing all the skills he's learning, and thought it would be good to get him some of his own equipment. Please let me know in the comments what you are getting your children for Christmas!